Ultimate Product configurator tool for Screen Printers, Digital Printers, Promotional Product Distributors, Award Companies, Apparel/Team Jersey Maker/Printers, Embroidery Companies. Ready to go with Magento, Shopify, Woocommerce, Prestashop, VirtueMart, and others. Inkybay is a web-based product personalization tool for print shop and e-commerce stores that automate order processing, increases revenue, customer trust, reduce production time and business efficiency. 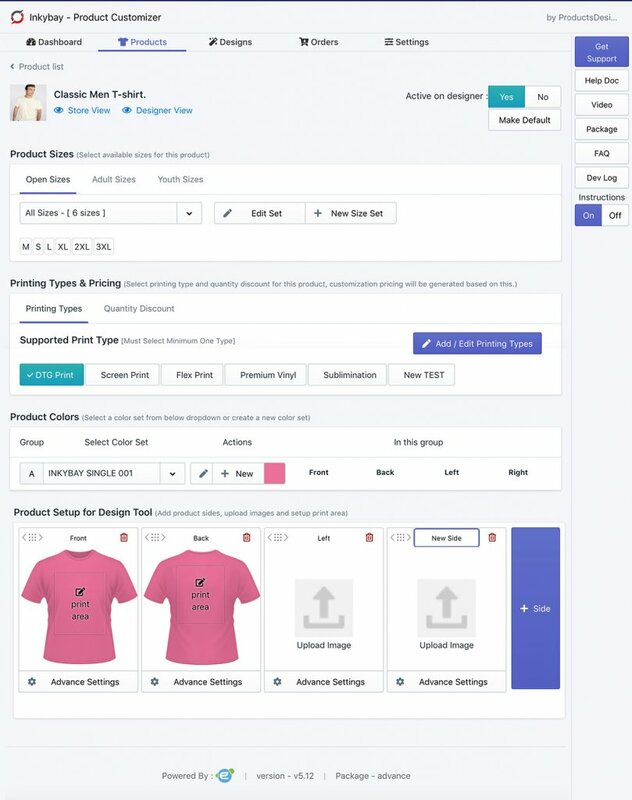 Our advanced product customizer allows you to sell personalized products in your existing online store and automate the processing of custom orders. We introduce outstanding customization experiences for your customers by allowing them to create and visualize their own, perfect products with Inkybay Web-to-Print Solution. Inkybay helps eCommerce print shops to sell any type of customized or configurable products like Apparels/T-shirts, team jerseys, mugs, laptop/mobile cases, business cards, awards, shoes, signs, stickers or any other items you can imagine. The designer software works with any kind of printing methods – Screen Print, DTG (Direct to Garment), Sublimation, Embroidery, Flex printing, Flock printing, Vinyl Printing, Engraving, and more. Easy integration with e-commerce platforms (Magento, Shopify, BigCommerce, Opencart, Prestashop, Woocommerce, Virtuemart) as an extension or plugin. All-in-one online product customization software with rich personalization tools which helps print shops to increase sales, reduce errors, and save time. Let your customers visualize what actually they are getting. Our real-time product visualization technology show product configuration as they design. Support any printing types (Embroidery, screen printing, DTG, dye sublimation, flex print, vinyl cut and more. Manage Pricing based on print type. Easy integration with existing or new eCommerce store with Magneto, Joomla/VM, Woocommerce, Opencart, Prestashop or custom. Inkybay build with non-flash HTML5/JS advanced technology which support any device and all modern browser. Mobile UI for easy ordering. All-in-one web2print software solution to personalize t-shirt/apparels, Laptop and mobile case, business card, car sticker, sports mat, shoe, door/window, bicycle or any type of configurable product right on your website to provide your customer best customization experience with real-time visualization. Your business has a lot to offer… and your website should reflect this fact! Custom product design software turns your business into a flexible online service. It helps you to cut costs, save time, eliminate waste by producing on demand, and build stronger customer loyalty. Connect with us today to gain access to everything you need — We’re standing by to help you implement the customized modifications and technical website improvements to turn your printing business into an efficient online operation. Manage everything from your own eCommerce shopping cart backend admin with easy options. Manage configurable products, per-decorated design idea/templates, your own fonts, add unlimited artwork, printing methods, multiple pricing setups and lot more. Manage personalization option for products. Unlimited product colors, size set, supported print type, supported template category, product sides, Design area settings and add mark area. Manage unlimited product sides (like front, back, left, right…) and custom design area for every added print location. Configure your product with unlimited parts on every sides like a configurable sports jersey, bicycle, helmet, shoe, door/window, furniture, mats or even a car. You can add product parts based on customization needs, set multiple relation set relatively with other sizes. Set any additional price based on option and style. Set any parts as additional or optional user can choose. Set customization areas as square, rectangular, oval or upload any odd shape to let your customers know where they can print. Set size of the design area based on actual product. Manage printing colors based on printing types. Add/edit colors, set any addition price if have on printing colors, set advance color option (RGB,CMYK). Set color blending option on print type. Exiting things is you can upload any texture, pattern or glitter as printing colors. Configure your own pricing option for customized product, per print method, price table by number of product and per color quantity, pricing option by product and print size area, price by square inch. Setup fee per size or per color, per text char price, Team Name and number pricing and much more based on options. The price rules can be customized based on how you would want to charge your customers. 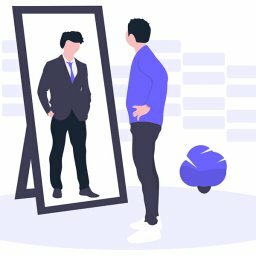 Upload your own unlimited artworks/cliparts, fonts, images with unlimited category/subcategory for easy access for your customers while designing their own personalized items. Design Idea Builder Software gives you advanced setting options and pre-designed templates that can be edited and personalized by adding your choice of text, shapes and custom or uploaded images. Keywords for templates can be searched by category, making it quick and easy to get started. All designs are formatted and downloaded as a print-industry standard vector file. 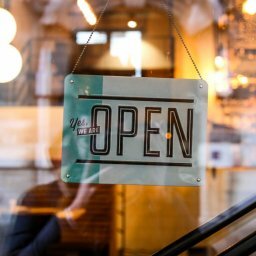 This feature allows for simple partnerships to be established with third party vendors to edit the designs or to fulfill any unique production specifications. In addition, all side vector designs are combined into a downloadable ZIP package which will include PNG proof views along with product descriptions and details. You will get all required information to submit a quote to customers who request for quote before they actually purchase. You will get all design and vector file as user design with user information the submitted. 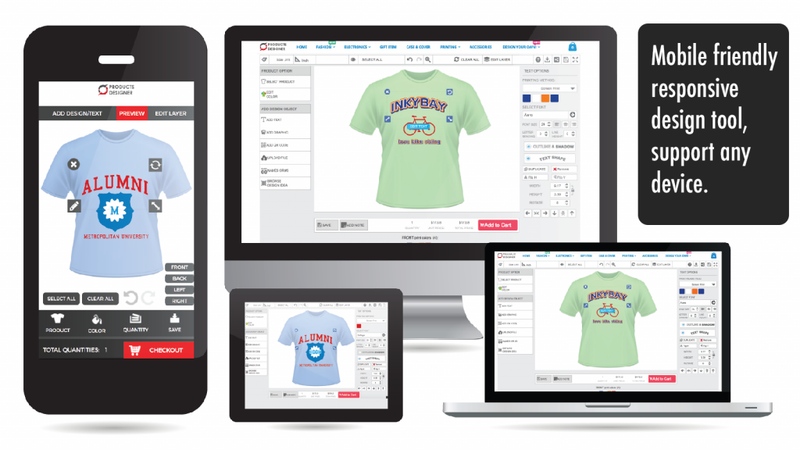 Check out real examples of Custom Products Designer and online t-shirt designer software. Start your 14 days free trial now on Shopify! 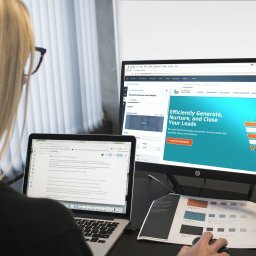 How can I order Product Designer Software for my business? Use our Contact form or contact email with your desired product version and domain name, send us a brief description of your business and requirement details for online product design tool. Our manager will contact you shortly about payments details and customization options (If you need further customization over current version). We don’t offer a trial version. Instead, we give a personalized LIVE Demonstration of Front end designer and Back-Office installed on our web server so right from there you can test the features available in our software. For an admin demonstration request, please use our contact form or send us an email to request admin demo. We will provide you the further instruction for admin demo. To view Front end demo please go to your desired software version details page and click on demo link from there. How fast should I expect to have designer software installed in my server? If you do not have any further customization requirements. It will take up to 48 hours once ProductsDesigner gets the payments. Do you offer customization service? Yes, we offer further customization service as your requirements. Customization service charge as low as 30 USD/per hour or we can quote you based on your requirements. Yes, we offer complete installation to your server/site for FREE. And there is no additional cost for installation. Do you have any additional or monthly charge? No, as our software comes with one-time payment option, we don’t have any other additional charge unless you need any additional customization. And we don’t have any monthly fee, Commission, Transaction Fee or Revenue Sharing. How I will get support? Support is FREE for 6 months! We provide support in multiple channels. Client side support via screen share, LiveChat and IM support for all clients. In the case of emergency, Call/Email/Text/IM us anytime in the 365(24×7) days of the year and we will answer.